I don't know what the deal is with kids these days. They don't want to make videos and do drawings online where they can put what they make into a virtual context. Okay. Maybe that's a tall order, and maybe were not there, yet. That's why I decided to meet my senior pop culture students where they were – a mix of paper and online research. 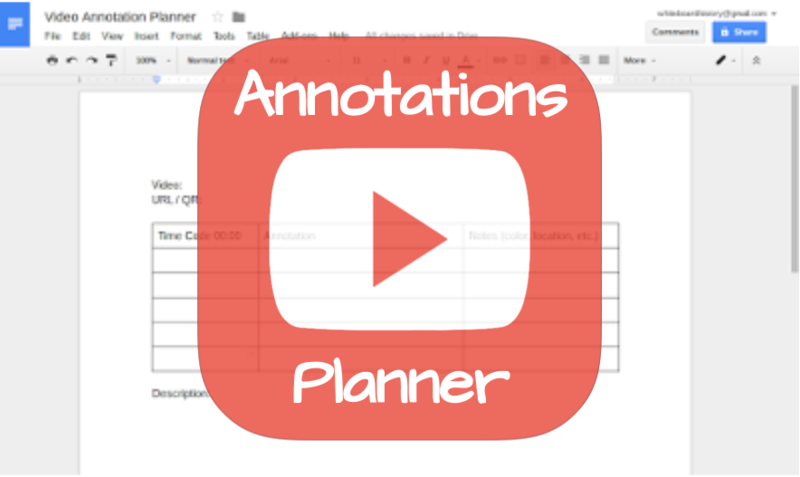 Participation went from a few nods and groans over the making-a-video choice to 100 percent in favor of a paper-based annotation planner. Since YouTube holds so many opportunities to build literacy, I focused the activity on the annotation feature. 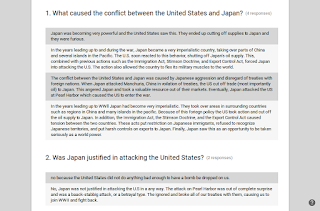 It's in the comments and links of a video that I thought my students would find practice in analyzing point of view by pretending that they are writing annotations for the videos they chose. It was a great way to let students choose lesson content and guide the discussion. My seniors did excellent work. The topic choices ranged from 1950's sexist TV commercials to job training videos. The annotations focused on main ideas and comments on issues that make us think twice these days. For example, one commercial from the '50s implied that wives should aspire to make great coffee for their husbands. We had plenty to discuss. When I was a senior in high school, we had a group project with the option of making a video. It was 1998, and the average household didn't have the video and audio recording equipment it does today. But we made it work, and I was given the directing and editing tasks. I wanted music on the video, but my procrastination was acting up. It was the night before, so all I could think to do was have video camera audio on the right and the music audio on the left. I used RCA cables to run audio from a CD player and video/audio from the camera to a VCR. I was no stranger to no-budget multi-track recording, so this concept immediately came to mind. Our English teacher loved it. The different songs we chose worked well in our pulp play of favorite characters and random scenes of stuff we teenagers thought worked great to transition the mood and support the tone. We got an A.
I told this story because I have struggled as a teacher to motivate students to make videos. Now that each student has video cameras, audio recorders, editing apps, and collaboration apps in their pockets, they don't experience the novelty like we did. It's as if making a video to show what you can do is too common place. Although I don't believe in forcing my students to do activities that would make them unnecessarily anxious, I understand that they are kids and can't see all of the opportunities in the context of adulthood. That's why it's a teacher's and parent's job to encourage them, and sometimes require them, to pursue opportunities regardless of the resistance. My approach to learning is to understand why the learner is resisting. In the case of making videos, I realize that there are a lot of reasons. Perhaps students don't practice making videos of themselves. Maybe they don't see the value in listening to what they sound like or look like when they speak. I can see them improving their literacies by making videos and doing more with them, but I also recognize the need to take it one step at a time and support the diversity of learners in my classroom. 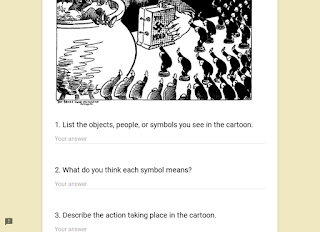 This post came from an idea for a performance task assessment that uses the concept of video annotation. The goal was to allow students to use YouTube to make decisions related to the production of a video. It also gave them practice using skills like evaluation, clarification, and comparison, to name a few. By design, the activity reinforced the importance of planning. It seems like every year, around the last couple months before school is out, I begin to reflect on the things that worked really well. Was it the strategy? Students? Timeliness of feedback? How we used technology? These questions, among many others, guide me through the reflection and improvement process. Our successes this year have pointed to the more routine learning activities. In many cases, technology has allowed us to generate and share information in ways we could not have otherwise accomplished. 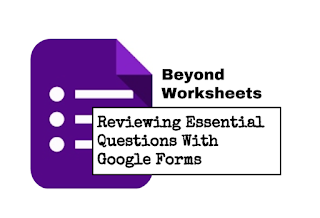 In particular, using Google Forms to send and receive various types of feedback has been very effective. Here are some of the ways I've changed classroom learning routines to integrate technology and improve access to feedback and other exchange of information. All of them use Google Forms to increase the access to information from student to teacher and vice versa. I love the idea of an exit ticket. It's one of the activities that students are motivated to do because class is over when they're done. And they usually put a lot of effort into writing them because they know that I actually read them and use the results to make lesson plans. 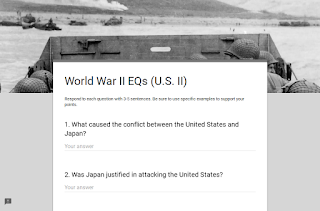 When Google Classroom came out with the Question post at the beginning of the school year, I was excited and thought that it would be great for exit tickets. I soon realized that Forms is still the way to go because it sends the results to a sheet, which is more versatile in terms of data analysis over time. Here's a video that shows my plan to set up sheets that automatically filter individual responses from a mother sheet. 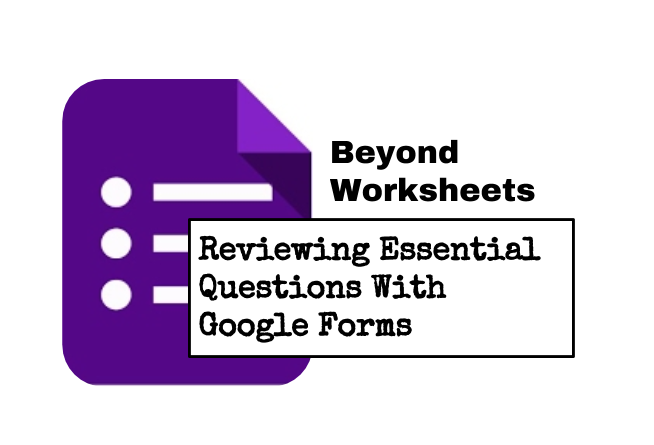 For each unit, I make an essential questions Google Form. The one below is for World War II. 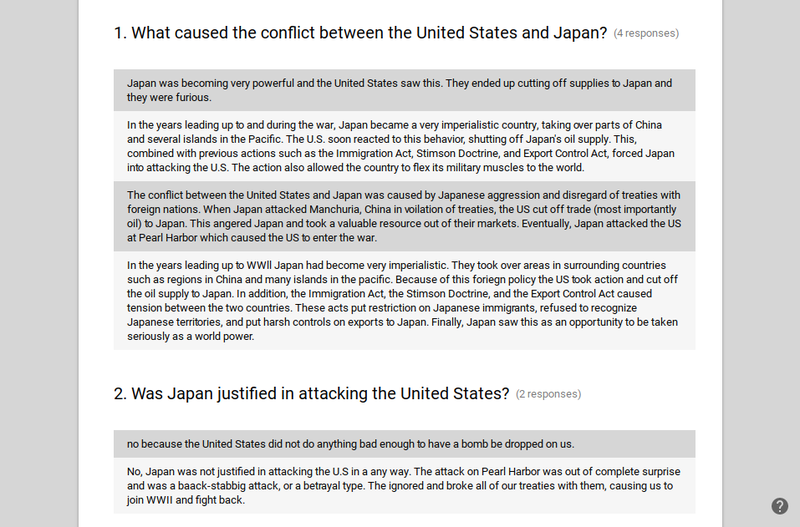 I assigned students questions and they used their notes and other resources to respond. This provided me with enough student work to show them what I expected. The image below shows how the responses are displayed in summary view. Although individual view is useful, the summary is better for displaying responses with the projector. Like I mentioned above, this is a great way to show the students the good, bad, and the ugly. If it's too ugly (or not good enough), I make time for students to work in groups to resubmit better responses. More on this in a future post. I used to print evaluation forms for students to complete after a unit assessment. The purpose of the self-evaluation was to reflect on achievement and to write goals to carry forward. Now that I use the Google Forms for this very important activity, I don't have to remember to make copies, self-evaluations can be checked anywhere (without a stack of papers to carry), and a running record can be easily analyzed during student-led conferences. We do a lot of image analysis, so the form is a great way to quickly collect all of the responses and debrief as a class. Since the questions are routine, making a new form is as simple as making a copy of a form that I designated as a template. Then, add the image(s) and customize the design. It's not hard for even the most novice user. Homework in my history class could be anything from guided reading to interactive activities and summaries of class notes. 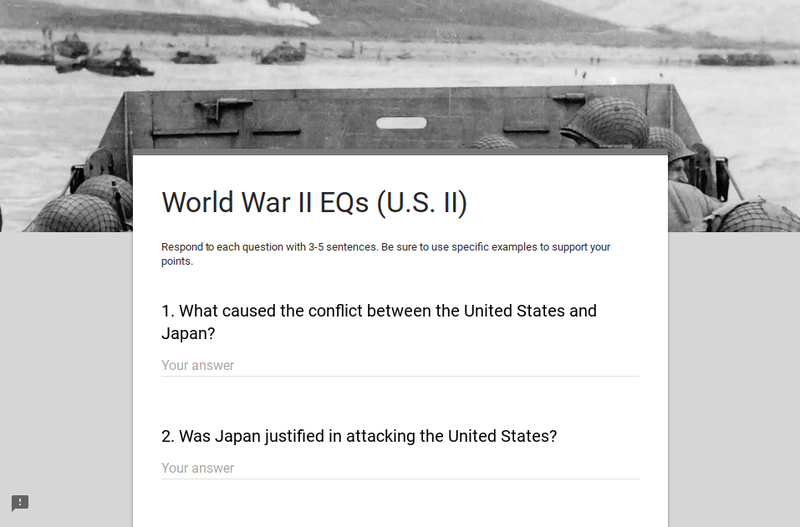 Forms works great for receiving all of the homework responses because we often use the homework content for classroom activities, which can be projected as described above. 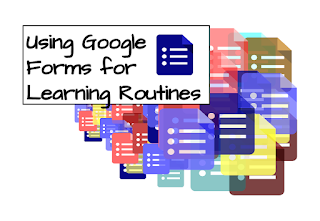 Forms allows students to turn in the work, whether practice or homework, without losing access to it. This also reduces wastebasket work because the students can do something with whatever the form collects. Further, I've observed students showing more effort when they know the class is relying on their contribution to complete the following stages of an activity (i.e., collecting map data for Google My Maps). 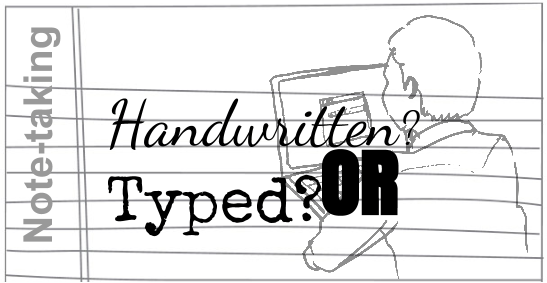 It's easy for a teacher at the end of her career to hold on to the misleading conclusion that handwritten notes are better for learning than typed. All the same, it's easier for someone like me – at the beginning of a career – to speak out against such hasty conclusions. Have you read the study on technology and writing notes published by Psychological Science in 2014? 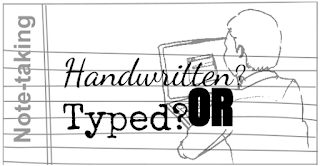 It concluded that college students participating in a Stanford study performed better after doing handwritten notes as opposed to typing on a laptop, for example. The more interesting result, however, was in the increased ability for handwritten note-takers to understand and apply concepts. The study hypothesized that this could be because of a tendency to write too verbatim when typing, resulting in less processing of the content. When notes are handwritten, the increased processing required to produce quality work fills a capacity to apply concepts in more ways than otherwise. My issue is not with the findings and methodology of the study. It's with the chatter and headlines. It's the technology's fault, right? What about teaching and learning? What about the fact that most students have poor work habits and teachers of college prep courses do too little to address the issue? I'm a college prep teacher who is guilty of not doing all that I can to prepare my students to be good learners. It reminds me of what Alan November thinks about school. He says school isn't about learning how to learn. It's about learning how to be taught. This is the problem that keeps me up at night because school ought to be about learning how to learn. Over the years, I've collected strategies for teaching literacy for all levels. Here's my working plan to address the issue with my high schoolers. Kids have a propensity for copying every word from a slide. Some worry that they won't have every bit of information to study, while some feel a sense of compliance by producing something during the class period. Copying slides is the worst. It does nothing. I can't even get into the fact that many words on a slide are a waste of time. Follow some of the other ideas on this list to make adjustments to practice. I was guilty of writing a lot of words on the slides. After learning about the danger, I realized that for my ELLs, the words could be turned into an exercise. Then, like most ELL strategies, I realized that all types of learners could benefit. The exercise is simple. Restate the words on the slide. Teach the kids that when they use their own words, they build knowledge out of information because they comprehend what they are reading. The assessment is usually a summary of the notes using a guiding question. A picture is only worth as many words as anyone can think of. Plus, a thousand words is a little arbitrary to be placing value, don't you think? How about five words worth just as much? The brain activity required to make that happen would lead to valuable learning, the kind with a healthy shelf life. If you have a question, it must mean you aren't smart, paying attention, or achieving much, right? Wrong! If the teacher is doing her job well, the students ask questions that cannot be answered without substance or depth. Unfortunately, that's what it takes to be successful yet that's not how we measure success. Okay, not every question will be ungoogleable (add that to your dictionary), and the fact is that kids constantly have questions – too often the wrong ones. For example, "Will the teacher think I'm stupid if I ask for clarification?" That's the wrong question. The right question would be, "What part of this problem do I not understand, and how can I ask for clarification?" The note-taking should be personal. Students should have questions on their pages that their peers don't (not always, of course). Likewise, their pages will be dotted with different answers to questions. Sketch notes are not just a fad. 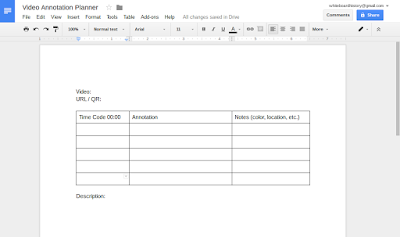 Moving away from the linear approach to note-taking makes it easier to do something with the notes. It allows us to make thinking visible and show relationships. Column notes are really popular for their organizational benefit. 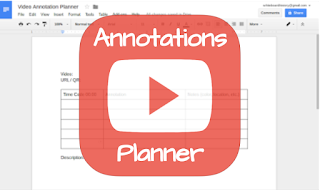 Whether it's half-page solution or Cornell notes, the benefit is really from the space left to make connections. Try using a column for main ideas and one for illustrations or symbols. Even basic icons and stick figures can be powerful for learning. I once had a student who could not read or write beyond a 1st grade level (in 10th grade). He came alive in class after I encouraged him to draw pictures as notes. He answered questions and improved his scores on exams (oral administration). Some information sticks and some does not. Sharing notes through discussion, not copying, is a great way for individuals to talk through their notes and begin the summary process. It's also an activity that exercises all four language domains: listening, speaking, reading, and writing. After seven to ten minutes of note-taking, ask students to stand and share notes. This gets them out of their seats and breaks up the activity a bit. It's harder to do this with a laptop, but there are ways. For example, students can see their screens while still standing, especially if they zoom in. While note-taking, students can write a question mark and leave some space to fill in information later. This is where typing notes comes in handy because space can be added at any time. Personally, I leave a few lines where I think I may need to add something later or ask a question. When I hand write notes, I leave the right or left third of the page for questions, main ideas, or symbols representing analysis or connections. If students are doing nothing with information, it escapes the memory in less than 20 seconds. If it is practiced, it becomes part of the working memory. A simple practice could be thinking about how the new information is similar to information with which students are very familiar. Making diagrams and graphic organizers can make connections by design (similarities and differences, non-examples, cause and effect, etc.). When students make connections, they build concepts and draw relationships among what they are learning with what they know (constructivist theory). Making their thinking visible will make the new information more permanent. Add a social activity to this process and you've given the human brain what it wants. The sumarization piece is the most important part (or product). It's the output that brings together the notes, connections, and questions into a grouping of the details into main ideas in a package that has focus. If I said anymore, it would be redundant. A one-size-fits-all strategy does not exist. It's all about the thinking. Some learners retain and can apply more if they listen more than write, while others need to write it all down before re-reading and making connections, finding areas of confusion, and writing short or long summaries of parts or all of the notes. In other words, it's what you do with the notes that matters more than the way you take them. Technology can change education, and it can change the world. These statements are true in positive ways if we recognize the problems brought to the learning environment when we add more glowing boxes. Let's face the facts. We don't know what so much screen time will do to our kids in the long run. In the short term, excessive time staring into the back-lit stream of information is detrimental. Screens at school. Screens at home. Where should kids catch a break. My answer is simple: everywhere. 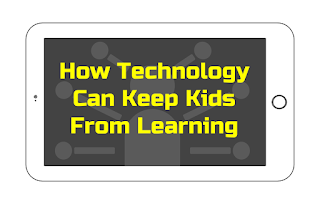 I'm not suggesting that technology that connects our kids to their peers and the world is bad. In fact, I love digital technology and believe that it can do so much more for education than paper. Think of this post as a reminder that too much of anything can be dangerous. Bottom line: In our excitement to meet kids where they are – how they learn outside of school – we need to safeguard their health. It's our job. Twitter. Facebook. Snapchat. Whatever it is that kids prefer. These platforms can be powerful when used to connect people – the right people. Social media can also be a huge distraction if limits are not placed on young users. The potential that a notification might release dopamine, or other feel-good brain chemistry, is enough to keep kids from becoming immersed in their academic studies. Never mind the vibrations and random tones that directly take the senses away from a lesson, one that the teacher has potentially spent more time creating and re-crafting than actually teaching. Use social media for instruction. We use Twitter for current events, this day in history, and showcasing work that makes us proud – we may connect with a class working on similar content. This isn't going to totally solve the problem, but it models academic use of social media. It just may contribute to our kids making more responsible choices and routines in the future. Managing files on several different devices can be stressful for many people. Contrary to some of the stuff we read on Twitter, most kids are not fluent in digital settings. Texting all day doesn't make them experts on all technology, obviously. This is the worst consequence of BYOD programs. It's great for all of the intentions and benefits of BYOD. But it is hard on students and teachers when a room has 15 different devices and file management requires just as many explanations. Factor in the 20 questions that kids ask about any type of activity or expectation, and the stress increases. I've taught in no-tech, BYOD, and 1:1 settings. The 1:1 setting was the easiest in terms of solving tech problems because we were able to complete tasks with one set of instructions. More importantly, students were more likely to help their peers routinely because they understood the problems without asking too many questions. Remember, classrooms are already a high-stress environment. They don't need added stress not related to learning content or applying skills. It will never be perfect, but we don't need to make it worse. 3. "I can just Google it." Curriculum is often focused on essential questions. The transferable nature of essential questions makes it easier for learners to build meaning. 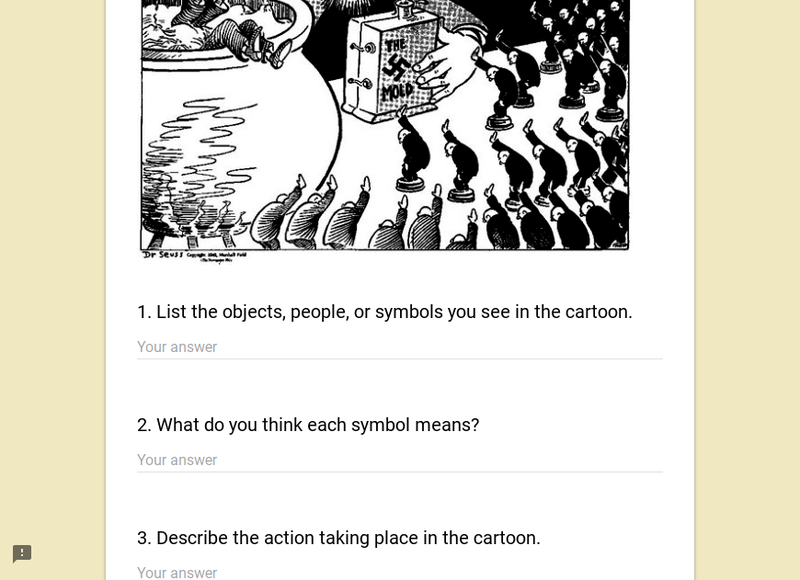 These questions are not Googleable (that's a word) and therefore powerful for deeper learning. It's the questions that can be researched immediately and with ease that we need to be weary of. Outside of the classroom, kids look up answers to their questions. They use Wikipedia, YouTube, and other sites. Why should it be any different in the classroom? And don't talk bad about Wikipedia until you actually know how it works, specifically (most people don't). The fact of the matter is that the ease and immediacy that goes along with looking up facts and accessing them right away is taking away a certain amount of contemplation and longevity from the learning experience. There's nothing wrong with Googling basic questions if educators find other ways to create the conditions that's lost when the facts are at our fingertips. One of my biggest concerns is the teacher who is not prepared to manage the technology that kids bring into her class. Some teachers deal with this in different ways. A popular strategy is to require students to place their phones in shoe holders on the way in. You know, the kind that hang on a closet door? Although I would never do this with my students, these teachers are not armed with a better solution. I can't knock it. Let's be honest. Kids do not use their devices responsibly. On my best days, kids aren't drawn to their phones because the lesson is engaging enough. On the bad days, I use a variety of strategies to cope with the distraction. The best strategies are the ones that employ the phones, tablets, and laptops. 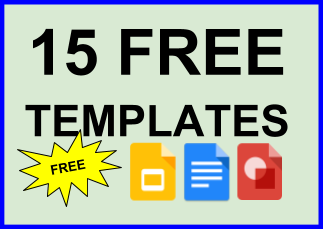 My student learning goal for next year is to increase the choices students have for homework assignments, presentation formats, and organizational tools (i.e., notebook versus Google Docs). The foundation for this goal will come from the cooperative learning activities and opportunities to collaborate with peers. What about the teachers who aren't connected educators? Who aren't computer using educators? What are we doing about the teachers who are only armed with rules that manage behavior? How are we training educators to come up with better ideas to provoke thought and stimulate creativity? For specific strategies, check out this post on managing cellphones. This is the problem most teachers are most concerned about. How do we compete with the exciting content that kids could be enjoying online? How can writing paragraphs that respond to an essential question about biological systems ever be as engaging as texting gossip among friends? The answer is not perfect, but it's basic. Build relationships. Many kids will stay on task and engage because they believe in themselves and the person asking them to do it. 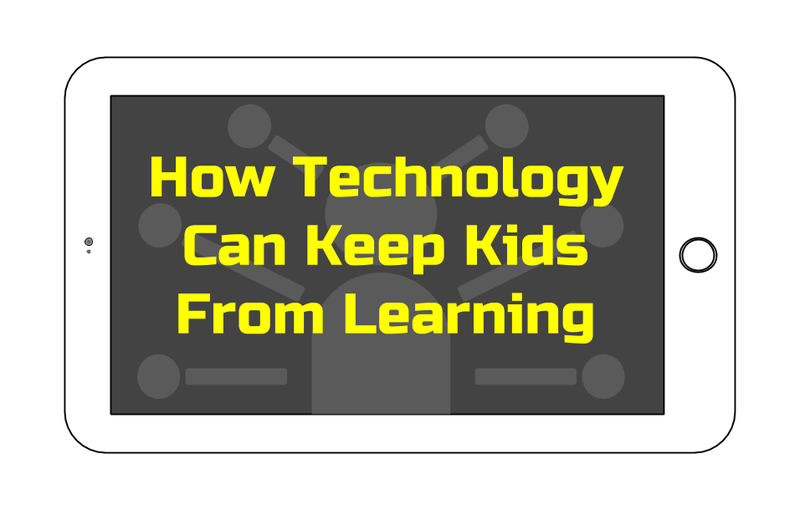 A blog post can't solve all of the problems that come with using technology in classrooms. But I will ask that problems like screen time, lack of contemplation for basic questions, and the distraction of "micro-fame" every time a notification lights up the blue-light laden screen be addressed for the education of our youth. Glowing boxes are not going away. That's why it's important to safeguard our children by arming them with best practices and understanding about the risks and benefits.